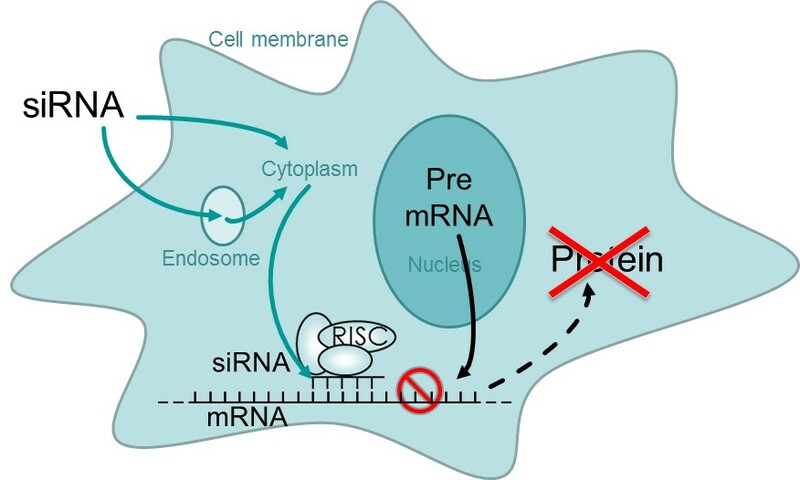 RNA interference is a specific inhibition of gene expression induced by the presence of a complementary double-stranded RNA, namely siRNA, in the cytoplasm. This silencing mechanism is present in plants, worms and mammalian cells, and is highly efficient and gene specific. RNA interference is mediated by RNA molecules in the cytoplasm, also called siRNA for “small interfering RNA”. These siRNA oligonucleotides are 21 to 25 base pair long, and their sequence is specifically complementary to a messenger RNA (mRNA). 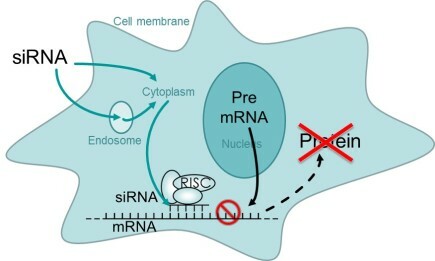 The siRNA recruits the RISC complex (“RNA-induced silencing complex”) to bind to its target mRNA in order to cleave it, which leads to silencing of the protein expression (Fig. 1). Fig. 1: RNA silencing mechanism in the cell. Before proceeding to the hands-on experiment, the siRNA has to be designed according to the goal of the study, and synthesized by a dedicated supplier. Then comes the siRNA transfection step itself, followed by measurement of gene silencing and/or phenotypic assays. Introducing siRNA into a cell can create some side-effects. These off-target effects are generated by recognition of 3’ UTR sequences inducing translation inhibition and/or mRNA degradation, or by recognition of mRNAs other than the target gene, which both result in non-specific silencing in the cell. In order to avoid off-target effects, the siRNA must be designed with several algorithms to ensure a fine-tuned targeting. Furthermore, non-specific interactions can be avoided by working with the lowest possible siRNA concentration. When analyzing the results, make sure to know the half-lives of the protein and mRNA of interest and to measure gene silencing accordingly 24 to 96 hours after transfection. Gene silencing should ideally be evaluated at both mRNA and protein levels. Our INTERFERin® reagent is perfectly suited for efficient silencing at low siRNA concentration, thus ensuring more reliable results. INTERFERin® achieves 90 % transfection efficiency in a broad range of adherent and suspension cells, and is easy to implement in the lab thanks to its compatibility with serum and antibiotics.